We’re just going to come right out and say it: mushrooms are weird. They pop up without warning and they can change the weather. Many of them can also glow in the dark, and we don’t know why. Now, at least, we might know how, as researchers writing in the journal Science Advances reveal the bizarre, “promiscuous” process of fungal bioluminescence. Lots of animals light themselves up, glowing or flashing to send messages, find prey, or flirt with potential mates. And scientists have a pretty good understanding of how that happens. When a pair of enzymes called luciferin and luciferase combine with energy and oxygen, the resulting chemical reaction makes a compound called excited oxyluciferin. But excitation is not sustainable, so the oxyluciferin releases its fizzy energy in the form of light. Scientists hypothesized that fungi were probably doing something similar (although really, with fungi, anything is possible). To learn more, an international team of researchers analyzed extracts from two glowing mushrooms, Brazil's Neonothopanus gardneri and Vietnam's poisonous Neonothopanus nambi. They found that both species were sticking with the traditional luciferin-luciferase playbook … kind of. They were definitely making their own proprietary blend similar to excited oxyluciferin. But the luciferase that the mushrooms were using was, in the scientists’ words, “promiscuous”—that is, it was happy to mix and mingle with multiple types of luciferin. 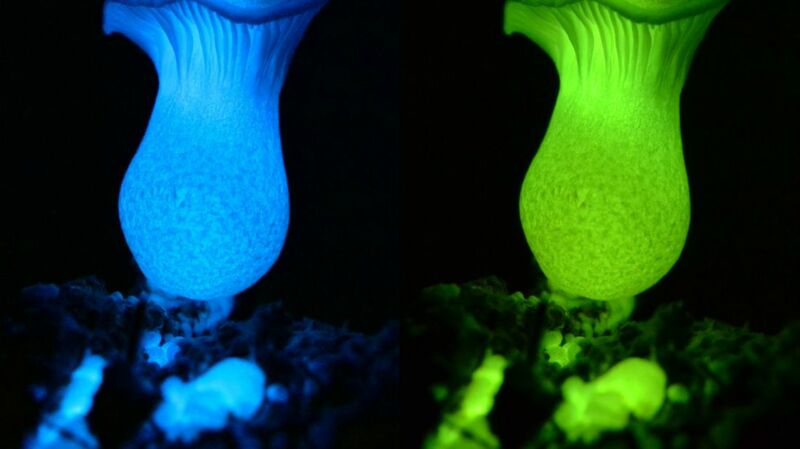 And while the only bioluminescent fungi we know about all glow green, the researchers write that the luciferase’s indiscriminate approach could lead to a rainbow of lights in different colors and intensities. “Future work on the isolation, characterization, and heterologous expression of the luciferase will stimulate the development of fungal bioluminescence–inspired applications,” the authors write. In other words, hey, we know about this bizarre thing now. We might as well use it.